Gene Davis was a self-taught artist and founding member of the Washington Color School. Before he began to paint in 1949, he worked as a sportswriter, following the Washington Redskins and other local teams. As a journalist in the late 1940s, he covered the Roosevelt and Truman presidential administrations, and was often President Truman's partner for poker games. Although Davis lacked a formal education in the arts, he taught himself to work in a variety of formats and media through frequent visits to museums and galleries in Washington, D.C. and New York. Noted for his innate compositional ability, he also gained the guidance of his friend and fellow painter Jacob Kainen, Curator of the Smithsonian's U. S. National Museum. Though he would later join the faculty of the Corcoran School of Art, Davis has acknowledged that his own nonacademic background freed him from the limitations of a traditional art school orientation. Davis came to be regarded as a leader of The Washington Color School—a group of prominent mid-century color field painters known for creating abstract compositions in acrylic colors on unprimed canvas. Despite his association with this group, Davis’s goals differed from those of its other members. Whereas others in the movement preferred to create predominantly symmetrical images that articulated their totality at a glance, Davis’ compositions reveal their complex internal relationships most effectively through sustained viewing. Gene Davis remains among the most celebrated of American painters. Continuing to receive significant critical attention, 2007 witnessed the Corcoran and the American Art Museum coordinating efforts to paint a giant color stripe scheme on the streets of Washington D.C. in honor of his achievements. His works are collected by prominent institutions internationally, including The National Museum of American Art, The Tate Gallery, The Solomon R. Guggenheim Museum, The Metropolitan Museum of Art, the Walker Art Center, MN, the Phillips Collection, D.C., the Smithsonian American Art Museum, and The Hirshhorn Museum and Sculpture Garden. Gene Davis was a self-taught artist and founding member of the Washington Color School. Before he began to paint in 1949, he worked as a sportswriter, following the Washington Redskins and other local teams. As a journalist in the late 1940s, he covered the Roosevelt and Truman presidential administrations, and was often President Truman's partner for poker games.Although Davis lacked a formal education in the arts, he taught himself to work in a variety of formats and media through frequent visits to museums and galleries in Washington, D.C. and New York. Noted for his innate compositional ability, he also gained the guidance of his friend and fellow painter Jacob Kainen, Curator of the Smithsonian's U. S. National Museum. Though he would later join the faculty of the Corcoran School of Art, Davis has acknowledged that his own nonacademic background freed him from the limitations of a traditional art school orientation. Davis came to be regarded as a leader of The Washington Color School—a group of prominent mid-century color field painters known for creating abstract compositions in acrylic colors on unprimed canvas. Despite his association with this group, Davis’s goals differed from those of its other members. Whereas others in the movement preferred to create predominantly symmetrical images that articulated their totality at a glance, Davis’ compositions reveal their complex internal relationships most effectively through sustained viewing.Though he worked in a variety of media and styles, including ink, oil, acrylic, video, and collage, Davis is best known by far for his acrylic paintings of colorful vertical stripes, which he began to paint in 1958. 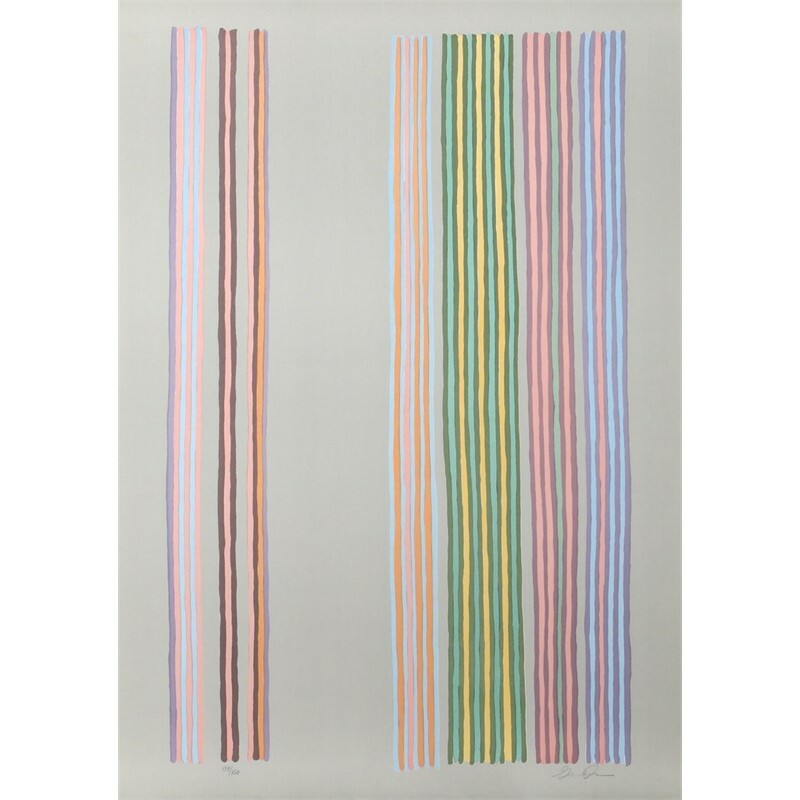 The equal-width stripe paintings typically repeat particular colors to create a sense of rhythm and repetition that sustains extended periods of viewing. Davis suggested that a viewer should "select a specific color . . . and take the time to see how it operates across the painting. When asked about the incorporation of time in his work, he often compared himself to a jazz musician who plays by ear, describing his approach to painting as “playing by eye“ and his variegated color intervals as “beats” or “syncopated rhythms.”Gene Davis remains among the most celebrated of American painters. Continuing to receive significant critical attention, 2007 witnessed the Corcoran and the American Art Museum coordinating efforts to paint a giant color stripe scheme on the streets of Washington D.C. in honor of his achievements. His works are collected by prominent institutions internationally, including The National Museum of American Art, The Tate Gallery, The Solomon R. Guggenheim Museum, The Metropolitan Museum of Art, the Walker Art Center, MN, the Phillips Collection, D.C., the Smithsonian American Art Museum, and The Hirshhorn Museum and Sculpture Garden.